Many so-called “free” website builders are only free until you want to make your new website live online. But there is one that is completely free as long as you don’t want to put it on your own domain. 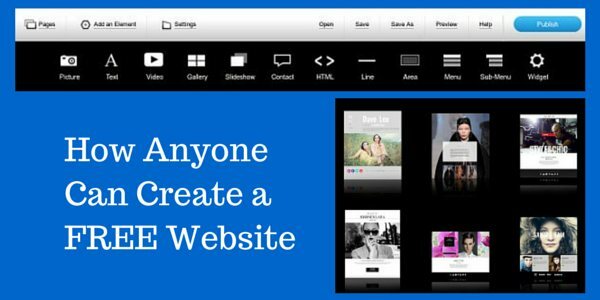 IM Creator is an easy to use website creator that really is free to publish. Whether you need a quick website to promote an event or to share photos with friends, family or peers, or to support a cause, IM Creator is free to use. Do you have a message you want to share with the world? Using a free website creator is far less technically challenging than installing and maintaining a blog. You could keep adding pages to a free site. The primary advantages to this particular website creator are that there is a totally free option and it is among the most simple to learn and use. If you already know how to use a word processor, creating a site will be easy. Many sites allow you to experiment and create your site for free, but then charge you when you want to make your new site public. Even IM Creator has to charge you if you want your site hosted on your own domain. But if you don’t mind using their domain you don’t have to pay. If you want a short, easy to share domain you may want to register your own. This is especially beneficial if you have a business and want to print the domain on stationary or list it in directories. By using templates, your site already comes with a design and layout that is consistent on every page. Consistency is important for any site. Navigation elements should always be in the same place. Using a color scheme and the same header and footer on every page lets your visitors know they’re still on your site. Give some thought to what colors you want to use. Colors affect how we feel and our actions. Color choices used by stores can even influence our buying decisions. Consider choosing two complementary colors in the same way your high school or college probably had two. Usually designers use one light color and one dark. Nothing makes a site more attractive than photographs and images. When you create your site, you want to use images that will load quickly and fit in the space available. Starting with images that are a reasonable size (usually under 160kb) is a best practice, but you can just click the ‘fit’ button in IM Creator and it will resize your images for you. You can also use the adjustors to make images larger or smaller and drag and drop them where you want them. Don’t just “borrow” images from sites online. They may be copyrighted and using them could get you in expensive, legal hot water. Use your own photos or only those you have explicit permission to use. Find out more in 43+ Free Blog Images Sources: Where to Get Free and Royalty Free Photos. Don’t forget to include information on how to reach you if you want your visitors to be able to get in touch. Think first about what you want to make public. Once information is online it is likely to be archived where you can’t have it removed. Website templates usually come with multiple pages including one for contact information about you. If you don’t want to use a page you can just delete it. When building a site for businesses or organizations, it is best to include their name, address, phone number and a link to their contact form on every page. This is usually placed in the footer. Websites are great for anything you want to make public for anyone to see. If you want to organize thoughts or research to share only with a few privately (or keep to yourself), consider using something like Trello instead. What do you know that could benefit others? Put it online and you can make the world a better place.